How Top Five Food Industries Take Orders Through Mobile App? Why food industries is a perfect marriage for mobile apps is because it is highly systematized with easy options on selecting the menus. Just like in the counter the cashier takes orders, the same way the mobile app is adapted to order items. The usual way of taking orders from the counter is replaced with processing our own payments by credit card on the app instead of giving it to the counter person in the restaurant. It eradicates the use of an intermediary and enables direct communication through the app. Starbucks is on the rollout of its mobile ordering service on a trial basis in Portland, US. Out of 13 million customers in the US which are active on mobile apps, 7 million mobile transactions in Starbucks has taken place – which is nearly 16% of the total transactions. Starbucks already having 13 million active mobile users, POS payment systems and a 9 million+ customers who on their rewards program, it is just an addition to their organization by integrating mobile ordering service. DNKN is coming up with new mobile payment facility in US that will enable the customers to buy and add money through Dunkin Donuts Cards across Google Wallet. Users can save their credit/debit card information on wallet which is linked in the app. Dunkin is also working on mobile ordering and pay-ahead option in order to enable customers sidestep the queues. Dunkin believes that it reduces waiting times during rush hours and enhances operational efficiency. The burrito company has created an ordering app which lets iPhone and iPod users to place personalized orders at their restaurant and pay through the mobile devices itself. It is nearing around three-quarters of a million downloads which was achieved simply through word of mouth. It has not advertised widely but only through social media channels and Apple iTunes store. 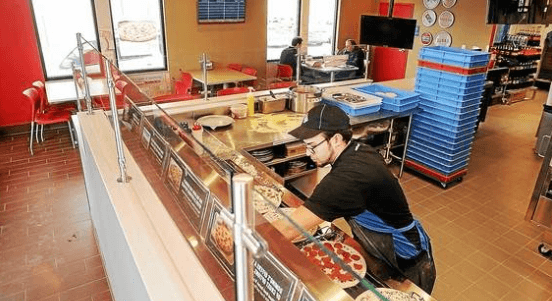 Dominos pizza’s mobile ordering app allows you to order pizza anytime from anywhere. You register with your mobile number and download the app. You will receive a password to your mobile through SMS and login to the app. The app will retrieve your address details when you make an order online. Available on all kind of smartphone platforms, it offers discounts of 25% on orders which are booked through mobile app. Aimed at, under age 34 group, McDonalds’ effor to increase sales at US restaurants through the mobile ordering app, it’ll have an NFC i.e., near-field communication system. This is using the GPS facility for the Android and iPhone users who can select McDonald’s stores and look for special deals in the app. It also tested pay-ahead apps at some specified store locations alone by using apps linked to credit/debit cards. This is a facility where the customer comes in to the restaurant and makes an order. After making the order, the electronic coupon code is scanned to complete the payment. While we see the transition of major restaurant companies to mobile ordering, it is not without valid beneficial features. Firstly, the companies can get huge orders coming in. Reports say that 25% increase in online orders have been registered since the number of hours spent online by people is increasing everyday. Secondly, apart from being online, people use mobile internet also. Thirdly the convenience with ordering over a mobile app is much better because of personalized choices by customers is more achievable that too from anywhere.